Soviet Solitaire Game - FunGames.com - Play fun free games. 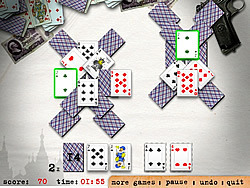 Soviet Solitaire is a fun game classic solitaire variation by Play-Free-Arcade.com . Try to clear the table. Find pair for each card and destroy them. If you failed to find the pair - use stock. You have limited time on each level.